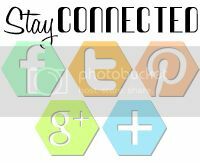 There's also a FUN Summer Coffee Lovers Blog Hop happening now that you must check out! Tons of sponsors including VERVE STAMPS! A new sketch at Viva la Verve went live this morning, too! I turned the sketch to show off my Verve-i-licious cup of coffee "table setting." The lace doily, floral and coffee cup remind me of my breakfast nook! 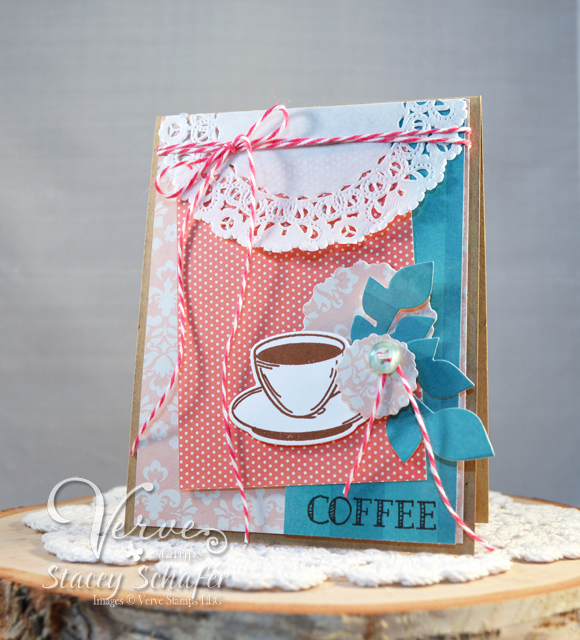 I stamped the Coffee cup and cut using the coordinating Cuppa Joe Die Set, and the Coffee sentiment was stamped near the bottom accent strip. A few flowers and leaves were cut from the Floral Circles Die Set and Dreamy Leaves Die Set to create a bouquet of sorts. Flowers and coffee just go together, huh?! Cute card, Stacey! I love the look of the doily and the pretty colors. I hope I'll be able to play along this month! just can't go wrong with a doily and polka dots! Great interpretation of the sketch. Doilies are alwAys a winner. Love how you used a doily for the sketch. I am a coffee lover through and through! I'm inspired to have a cup and make a coffee card! This is so cute! Great layers! Adorable card! Love the pretty details! Beautiful card! I love the pretty details! So gorgeous, Stacey! You're the queen of designer paper. Love this card! Love all the layers and the colors you chose! sweet! this looks like a perfect card to go with a bakery treat! This is great Stacey! And the doily is perfect with this theme too! Such an absolutely pretty card. I really like all the cards this time and the theme is wonderful. I love the paper doily and bakers twine. Great card. Love the colors you chose. Cute card. I like the way you used the doily. You used my favorite color combination on this card. Love the layout too. Well done. Shhh....don't tell anyone...this is my favorite....LOL. The doily and pink damask add such an elegance to this card. It's stunning! So pretty, Stacey, wonderful colors and beautiful design! Enjoy the hop! Your card reminds me of sitting down by the river in Savannah, Georgia with a mug of coffee in hand! super love this Stacey....swooning on the red/blue color combo! I own this set and just love it! The colors you used are fantastic!!! Love the sketch you used and the red, white and blue color combo is perfect for 4th of July and the summer! Stacey this is sooo pretty ! Beautiful card...love the colors and the doily! Love the doily you used and the colors are fantastic! What a great card! Love your colorful card and the cute cup. Love your card!! Beautiful colors. Lovely! I like the floral accent. Fun card Stacey, loving the doily! Your card rocks! Love how you followed the sketch and the colors you have used!! Great card idea. Lovely colors and I love the doily addition. Lovely card. Love the dimension. Very, very pretty! I love the great colors and that sweet doily. Beautiful card with so many sweet details! so pretty love the colors!!! Stacey, this is SO pretty! Love all the layers and elements you've added! Hey Stacy! This is so pretty- reminds me of a 50's diner with that coffee cup. And what a great use of the sketch; I did not even recognize it at first! Such a Gorgeous card!! Love the color combo and beautiful details! What a fun card! Happy hopping! Love these colors! What a great take on the layout here and I love all the extras - thread, button, dies. Cool! Wonderful card! Love the doily! Gorgeous creation, love the colors and the style of doily! So pretty Stacey. Love the coffee cup and the colors. The doily on top looks wonderful with the twine. Such a pretty card! Love all the detail - the doily, leaves, button, twine - all comes together perfectly! What a fun card,lovely colors and yummy coffee. Very pretty! And what a great take on the VLV sketch! 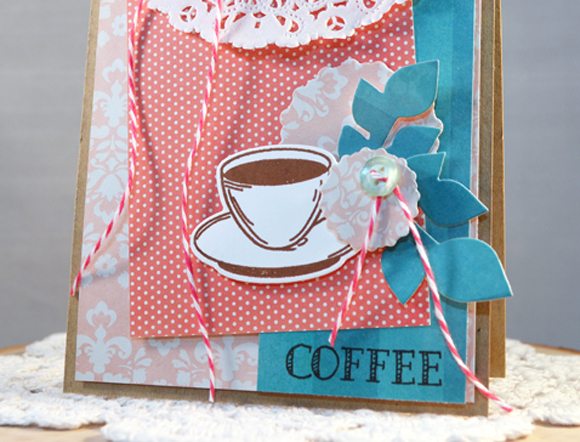 Such a pretty card -- love how you used this sketch and I really love the cup and saucer. great card, love the doily! Such a pretty card love the sketch the colors and that doily. TFS. Beautiful Stacey! Love the color combo. Super card Stacey! Lovely colors and I love the half doily across the top! This card is so cheery; the twine adds so much! Beautiful! Love the added doily! Very pretty! Love the colors and the doily. I love your use of the doily and the great die cuts! Oh this is so beautiful, love the image and the great design. Fabulous colors. This is so pretty! I love that doily and dainty bow.